Figure 4.11: Some polar triatomic molecules. Two different modes of rotation are indicated for the H2O molecule. There is a third mode of rotation about an axis perpendicular to the page. think of the interaction in semiclassical terms. The reason is that the wavelength of infrared is on the order of 10 pm, which is two to three orders of magnitude larger than the size of the molecules we will be considering. Thus, one can think of the infrared light as providing a large scale fluctuating electric and magnetic field which alters the environment in which the molecule finds itself, and exerts a force on the constituent parts of the molecule. This force displaces the nuclei and electron cloud, and excites vibration or rotation. Conversely, a vibrating or rotating molecule creates a moving charge distribution, which classically radiates an electromagnetic wave. While one must fully take into account quantum effects in describing molecular motion, one need not for our purposes confront the much harder problem of quantizing the electromagnetic field as well (the problem of "quantum field theory"). The only way in which we make use of the quantum nature of the electromagnetic field is in converting the energy difference Eu — En into a frequency of light, via AE = hv. The strongest interaction is between an electromagnetic field and a particle with a net charge. A charged particle will experience a net force when subjected to an electric field, which will cause the particle to accelerate. However, ions are extremely rare throughout most of a typical planetary atmosphere. The molecules involved in determining a planet's energy balance are almost invariably electrically neutral. The next best thing to having a net charge is to have a disproportionate part of the molecule's negatively charged electron cloud bunched up on one side of the molecule, while a compensating excess of positive charged nuclei are at the other side. This creates a dipole moment, which experiences a net torque when placed in an electric field, causing the dipole axis to try to align with the field. Interactions associated with higher order moments than the dipole lead to absorption many orders of magnitude weaker than the dipole absorption, and can be ignored for most planetary climate purposes. Many common atmospheric molecules have no dipole moment in their unperturbed equilibrium state. Such nonpolar molecules can nonetheless couple strongly to the electromagnetic field. They do so because vibration and rotation can lead to a dipole moment through distortion of the equilibrium positions of the electron cloud and the nucleii. As illustrated in Figure 4.9, diatomic molecules made of two identical atoms, do not acquire a dipole moment under the action of either rotation or stretching. Symmetric diatomic molecules, such as N2, O2 and H2 in fact have plenty of rotational and vibrational transitions that are in the infrared range. Because the associated molecular distortions have no dipole moment, however, these gases are essentially transparent to infrared unless they are strongly perturbed by frequent collisions. This is why the most common gases in Earth's atmosphere - N2 and O2 - do not contribute to Earth's greenhouse effect. However, it is important to recognize that situations in which diatomic molecules become good greenhouse gases are in fact quite common in planetary atmospheres. When there are frequent collisions, such as happen in the high density atmospheres of Titan and on all the giant planets, diatomic molecules acquire enough of a dipole moment during the time collisions are taking place that the electromagnetic field can indeed interact with their transitions quite strongly. This makes N2 and H2 the most important greenhouse gases on Titan, and H2 a very important greenhouse gas on all the gas giant planets. In terms of volume of atmosphere affected, Hydrogen is by far the most important greenhouse gas in the entire Solar System. Collision-induced absorption of this type forms a continuum in which the absorption is a very smooth function of wavenumber, without any significant line structure. Polyatomic molecules can also have significant continua, existing alongside the line spectra. Continuum absorption will be discussed in Section 4.4.8. CO2 is a linear molecule with the two oxygens symmetrically disposed about the central carbon, as illustrated in Figure 4.10. A uniform stretch of such a molecule does not create a dipole moment, but a vibrational mode which displaces the central atom from one side to the other does. In addition, bending modes of CO2 have a fluctuating dipole moment, which can in turn be further influenced by rotation. Both these modes are illustrated schematically in Figure 4.10. Modes of this sort make CO2 a very good greenhouse gas - the more so because the typical energies of the transitions involved happen to correspond to frequencies near the peak of the Planck function for Earthlike temperatures. Some molecules - called polar have a dipole moment even in their undisturbed state. Most common diatomic gases made of two different elements - notably HF and HCl - are polar, and their vibrational and rotational modes cause fluctuations in the dipole which make them quite good infrared absorbers. They are not commonly thought of as greenhouse gases, because they are highly chemically reactive and do not appear in radiatively significant quantities in any known planetary atmosphere. However, one must keep an open mind about such things. Most triatomic atmospheric gases (H2O, SO2,O3, NO2 and H2S, among others) are polar. CO2, a symmetric linear molecule with the carbon at the center, is a notable exception. Ammonia (NH3) is also polar, having its three hydrogens sticking out on one side like legs of a tripod attached to the nitrogen atom at the other side. Polar molecules couple strongly to the electromagnetic field, and their asymmetry also gives them a rich set of coupled rotation and vibration modes with many opportunities for transitions corresponding to the infrared spectrum. The spectrum is enriched because rotation about the axis with the largest moment of inertia (shown as the vertical axis for the water molecule in Figure 4.11) causes the wing molecules to fling outwards, changing the bond angle and the dipole moment. The molecule can also rotate about an axis perpendicular to the plane of the Figure, leading to distinct set of energy levels. Further, energy can be stored in rotations about the axis with minimum moment of inertia (shown as horizonal in the Figure). For a linear molecule like CO2, rotation about the corresponding axis has essentially no energy. 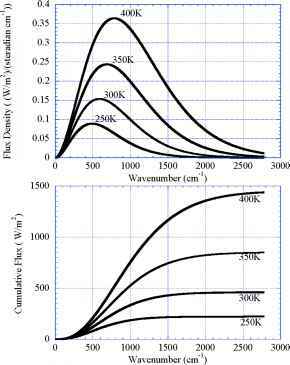 Figure 4.12: Lower panel: The absorption coefficient for CO2 at 1 bar and 300K, in the wavenumber range of interest for Earthlike and Marslike planets. The horizontal lines show the wavenumber range within which the optical thickness exceeds unity for CO2 paths of , 1 and 1000 kg/m2. Upper panel: The corresponding OLR for the three path values, computed for the same temperature profiles as in Figure 4.5. The OLR has been averaged over bands of width 10 cm-1. still not completely realistic, since, to keep things simple, it is carried out as if the absorption coefficient were uniform throughout the depth of the atmosphere. In reality, kCo2 varies with both temperature and pressure, though we'll see eventually that to a good approximation this variation can be handled through the introduction of an equivalent path, which is generally somewhat more than half the actual full-atmosphere path, if the reference pressure at which absorption coefficients are stated is taken to be the surface pressure. Figure 4.12 explains why the OLR reduction is approximately logarithmic in greenhouse gas concentration for CO2 and similar greenhouse gases. The key thing to note is that the absorption coefficient in the principal band centered on 675cm-1 decays exponentially with distance from the center. Hence, as the CO2 path is increased by a factor of 10, from 10 to 1 kg/m2, the width of the ditch within which the radiating temperature is reduced to cold stratospheric values increases only like the logarithm of the ratio of paths. This is true for paths as small as .01kg/m2 and as large as 100kg/m2. However, when the path gets as large as 1000kg/m2, the weak absorption bands on the shoulder, near 950 and 1050 cm-1 start to become important, and enhance the optical thickness beyond what one would expect on the basis of the central absorption peak. 1000 kg/m2 corresponds to a partial pressure of CO2 of about 100mb for Earth's gravity, or equivalently a molar mixing ratio of about 10 % for Earth's current surface pressure. This is far in excess of any CO2 concentration on Earth likely to have been attained in the past 300 million years, but is well within the range of what has been contemplated at the end of a Neoproterozoic Snowball episode, or earlier during the Faint Young Sun period. Many greenhouse gases also have a central absorption peak with exponential skirts, and these will also exhibit a nearly logarithmic dependence of OLR on the concentration of the corresponding greenhouse gas. With the notable exception of the collision-induced continuum discussed in Section 4.4.8, the absorption spectrum of a gas is built by summing up the contributions of the thousands of spectral lines from each of the radiatively active constituents of the gas. To proceed further, then, we must look more deeply into the nature of the lines and how they are affected by pressure and temperature.